It's a long period of time of no new post in this month and I would like to say sorry to all of my usual visitors. In this November, I had moved to fifth home in residency in Singapore. This is a prominent change of my stay in Singapore and in my work site too, new project has commenced. It is a busy time and lesser and lesser time I can give for my blog. Today, there is one of the major changes in blog. Most of usual visitors will notice that there is daily currency exchange update display on sidebar. Now, you will be able to view currency exchange rates for three years, for 2010, 2009 & 2008. I hope you all will have a reference for daily exchange rates and enjoy. For those who want to use this chart as a widget in your blog, you can copy below code and paste it into "Add a HTML widget" into your blog. It will update accordingly as long as I am updating in my spreadsheet. 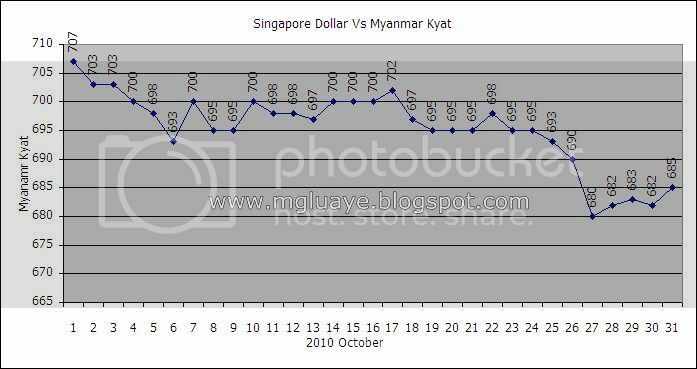 For the month of October 2010, the average exchange rate between SGD and Myanmar Kyat was 695.2903 Ks/SGD (9.8764 down from previous month average rate), highest was 707 Ks/SGD on 1st of October and fell lowest until 680 Ks/ SGD on 27th of October. 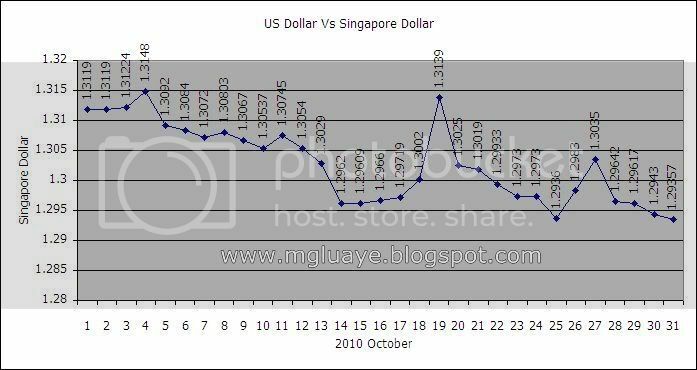 For USD vs SGD, the average rate for the month of October was 1.3028 SGD/USD (0.0318 down from previous month average rate), highest 1.3148 on 4th of October and lowest 1.2936 on 31st of October.